I'd like to thank Loren Howe, guest author and founder of preciousmetalpurchase.com for providing this article for us. Mr. Howe has been involved in precious metal investing for over a decade and here is providing us some information on those rare metals that are not "silver and gold." Mr. Howe can be reached at info@preciousmetalpurchase.com. 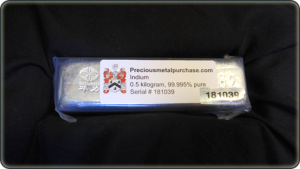 Indium, germanium, and iridium are available for physical purchase or resale through www.preciousmetalpurchase.com. Another option is holding industrial metals through offshore storage programs. The company www.swissmetalassets.com in Panama first developed this option. Through Swiss Metal Assets, much like an ETF, an investor can purchase and resell interest in several baskets of metals including indium, gallium, tellurium, tantalum, hafnium, bismuth, rhenium, molybdenum, chromium, and tungsten. A Canadian company www.smg-indium.com also operates as an ETF for indium. 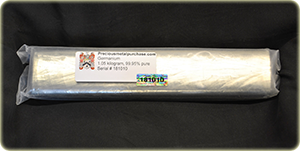 Lastly, many industrial metals are often available for physical purchase or resale through EBay. Rare industrial metals are used almost entirely for industry with little room to accommodate investment demand. Nearly all LCD screens, for example, use a dollar or so worth of indium. The price of indium could rise over 10 times before noticeably impacting the finished price of computers or flat screen televisions. It is little wonder that the media grudgingly tells "precious metal" investors to put their money into mining stocks, ETFs, or as a last resort physical gold and silver. Investing in mines subsidizes metal production and drives down prices, while gold and silver investors bid in competition mostly against other sound money proponents. It is interesting to imagine what would happen if sound money proponents forced the market to either allow a non-inflationary currency, or suffer the true consequences of price inflation. 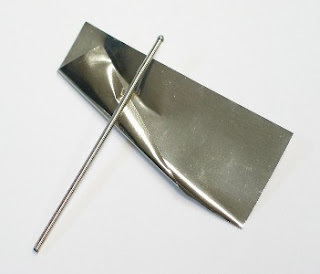 We can see partially, with silver, what happens when investors drive up the price of a rare semi-industrial metal which is not fully controlled by the Establishment. Despite sale from stockpiles, the price of silver increased by a factor of 10 in less than a decade. Now imagine what could happen with metals far more rare than silver, vital to industry, but with no current investor demand. In the interest of giving a balanced picture, it is necessary to discuss the downsides of rare industrial metals. A major problem, as discussed, is repression of the market in the Western Establishment. It becomes difficult to trade these metals when at every turn, you find a monopoly unwilling to deal with investors. Due to the general lack of an investor trading community, the spreads on rare metals tend to be greater - in the same way that the spread on palladium is greater than the gold spread due to a shallower trading pool. Secondly, although rare industrial metals are currently somewhat ignored by the media and regulators, it is likely that attacks will be stepped up if they begin to catch favor with investors. he fight for sound currency has always been difficult, but the community of sound money proponents has been making large gains in education (and profit) over the last decade. Rare industrial metals are a new tool which was effectively hidden but is finally coming to light. It will be interesting to see if this proves to be an unnoticed Achilles’ heel of fiat currency. 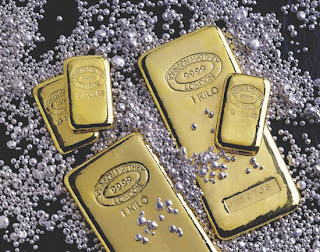 When people think of investing in precious metals, what immediately comes to mind are gold and silver. A few will also remember platinum and palladium. However that's not the full story. There are quite a few rare metals which are largely ignored by the media and are therefore almost never considered by any investor. It's interesting to learn how we got to this point. With the partial exception of silver, mining conglomerates and banking industry stockpiles exert strong control over the "precious metals" market. Consider that smart bankers know the main competitor to fiat currency is precious metal. What better way to neutralize the competition than to buy it out? Yes, standard precious metals still provide an inflation hedge, but the Central Bankers can sell their stockpiles or short sell futures contracts when the market overheats in an attempt to suppress metal prices. Finally when each inflation cycle slows, the metal markets drop. The large banks, which are experienced in this process, can buy back their stockpiles on the cheap. If hyperinflation sets in, governments often confiscate precious metals - which somehow always seem to then find their way back into the hands of the Central Bankers. Precious metals are certainly still one of the best ways for small investors to protect their savings. That's especially apparent in recent years. However, the Banking Establishment responses described above do create significant difficulties for small investors. This history was my starting point to research "other rare metals." The first fascinating thing you'll learn about other rare metals is that you are not allowed to buy them. Call up the very limited number of refining conglomerates which dominate the market. Ask, as an investor, to buy rhodium, iridium, indium, etc. It is simply not for sale to investors at any price in any quantity. Sure that's an apparent violation of anti-trust law, but regulations haven't been much of a hindrance in corporate America for decades. have might coated in a microscopically thin layer of rhodium. A very few small businesses have tried to physically sell ultra rare metals to investors using metal purchased from independent sources such as recyclers. It appears that targeting by government regulators often discouraged these attempts and the businesses closed shop. As usual, in Great Britain the situation has gone even further, with regulations restricting the sale of rare industrial metals to investors under the guise of fighting terrorist financing. Lastly, the Establishment attempts to control the conversation surrounding precious metals. We are told they are a bad choice, but if you are going to invest you only have four metals to choose from. The tiny minority of people who look past those four metals are then geared towards the rare metal rhodium. While rhodium certainly qualifies as a rare metal useful to investors, it is no more so than a dozen other unmentioned choices. The difference is that rhodium is largely monopolized by the same mining conglomerates which control the other platinum group metals. Thus, rhodium is available in a very limited number of investment options approved by the conglomerates which dominate production. There is a rhodium ETF (not available to Americans) run by Deutsche Bank and physical rhodium is available for purchase and resale through www.kitco.com. The remaining rare metals are ignored or occasionally ridiculed as investment vehicles in the Establishment media. The most reliable way around Western monopolies is to purchase metals which are produced outside of the Western Establishment's control. Fortunately there are numerous rare and valuable metals which are not dominated by conglomerates and which give investors unique opportunities. 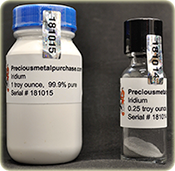 For example, indium is about half the price of silver but 40 times more rare, while germanium costs 3% of the price of gold while being 20 times rarer. Iridium costs around half the price of gold while it is an astounding 500 times more rare than gold by mining production. The entire annual world production of iridium could fit in a small bathtub. Check back next week for Part II of this article which will contain more information of how to invest in rare precious metals and where to buy them at a fair market price. For years I've been a big fan of The Cohen Mint. I bought from them, had a couple conversations over the phone with the founder of the mint, and even did an interview with him that you can find here. Now, over these past few years I've seen dozens of negative comments regarding Mr. Cohen's business. 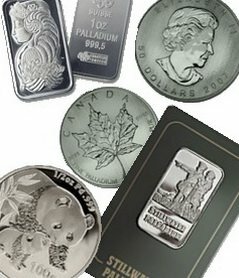 When I ordered my palladium coins or rhodium bars I realized that it might be a few months until they were delivered. So, I assumed that the complainers were just impatient. I think I assumed wrong! I believe I placed my last order in January 2012. I received my bars in May 2012. Problem: bars were both cracked. I contacted Cohen Mint several times and haven't gotten a reply. I called on the phone and haven't gotten an answer. Cohen Mint knows that I'm stuck with cracked bars. Cohen Mint SHIPPED me cracked bars (no way did they crack during shipping because they were padded well). I'm currently traveling Europe right now so any move I might like to make will be...not made. The only move I see that I would be making, though, is possibly to sell gold. Or, that would have been the goal a week ago. I don't know if silver is going to continue to drop or not. I'm hoping it will, because if it does "buy silver" is a sure rule! However, now, again, it's hit or miss. If one were to sell gold and buy rhodium I would completely understand the logic! Advice? I have none I'm strongly giving except to wait. If anything, silver has fallen a higher percentage than gold, so, selling gold and buying silver would not be an unfounded decision. Personally, though, I see $22 as silver's price and gold at $1600, meaning silver could still drop more than gold (if I were the world emperor, which I'm not!). Sooooo, in other words, I'm not doing anything with my metals/money at this point. If ANY of the five metals drops another 20% I say buy! If gold goes up 20% I say buy silver because it will follow.